Three weeks ago we asked when Merkel and Cameron would meet after they missed an opportunity to do so. The answer is today, in Berlin, and it sounds like they got on encouragingly well. Cameron talked to her about our policy review process and they’ve agreed to set up several joint working groups on issues like climate change, counter-terrorism and economic competitiveness. Minister Wolfgang Schäuble on counter-terrorism. 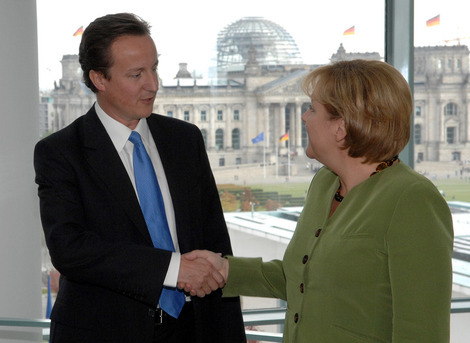 Cameron congratulated Merkel on disrupting the terror plot last week and agreed to make a speech to her party’s parliamentarians on security issues in late October. They also discussed how centre-right parties can work together, a favourite theme of this site.